Creative Circles in Google Plus. Google+ Circles are how you choose who you share your posts with. 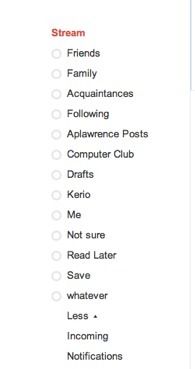 For example, I have a "Kerio Customers" circle, an "Oak Point Computer Club" circle and a "APLawrence.com" new posts circle. This post will be shared with the latter of those, but not the others. In some respects, Circles beat RSS feeds. Unfortunately, they aren't something you can just "join" - you have to tell me if you want to be in one of my special circles. Google may allow "subscribing" to Circles later, but right now you have to ask. However, you can be much more specific than you can be with RSS. You could say "Please put me in the Circle for Mac OS X posts and anything about Perl, thanks". That's trivial for me to arrange and after that, you only see what you really want to see. That's hardly the end of it, though. I have a few other circles: "Draft", "Read Later" and "Save". These all have one person in them, and that person is me. If I write something but am not quite ready to finish it, I "share" it with the Drafts circle. When I'm ready to go back to it, I just click on the "Drafts" link as shown here. I can edit it and, when I'm ready, copy it to a new post. Same idea. Re-Share it with that circle, come back to it later. Both of those ideas came from a Google+ post by David Yonge-Mallo, by the way. Something might go from "Read Later" to "Save" after I've read it. This is the stuff I may want to find again later. If this gets out of hand, I'll create more specific "Save" folders for different subjects. I'm not sure how much data Google is going to let us keep, but if it's anything like Gmail, I should be fine. If not, "Data Liberation" will save me - or let me save what I want to save, anyway. I may not have thought of them, but I bet someone else will. Google+ Circles aren't just for categorizing your friends and family!